Shown in the photo is a nice water tower from Lakeway, Texas, just west of Austin. The tower is mostly light blue with a nice white golf ball with painted dimples at the top. 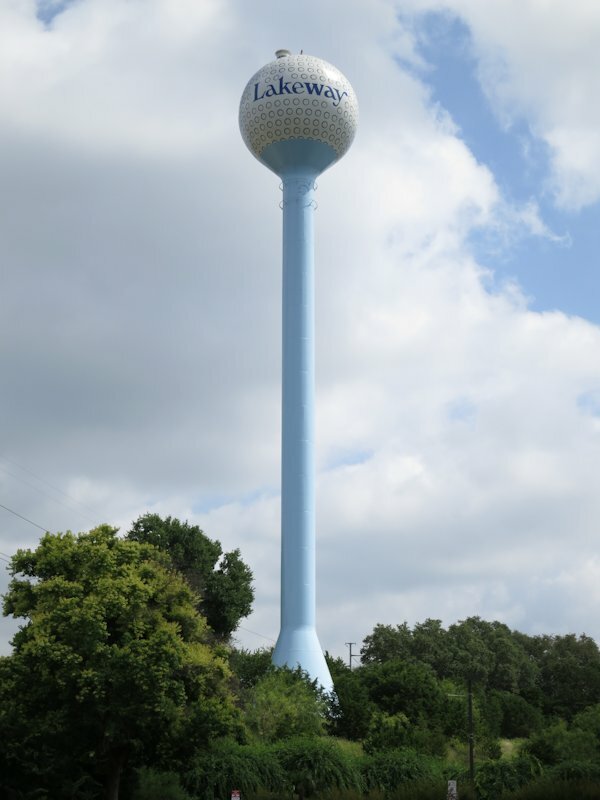 What make the paint scheme so nice is that this water tower is a rarity – a true water sphere. The golf ball theme would look downright silly on a water spheroid. The town of Lakeway has done a nice job with its water sphere. The paint is fresh, bright, and glossy. The tower is located a nice green hillock, right near the center of town, easy for all passerbys to see. There is a nice vent and signal light at the top. Like the Word’s Tallest Water Sphere, there are two collars near the top so stunt people can perform acrobatics, and space invaders can perform mind-control. If you see a nice water sphere in your area, please take a photo and send it to the web master of this site, and we can feature it in a similar article. Be sure to include the location, time of photo, and any strange history of the water sphere. This entry was posted on Sunday, July 28th, 2013 at 12:20 pm	and is filed under Competitors, Photos. You can follow any responses to this entry through the RSS 2.0 feed. Both comments and pings are currently closed.